Are you always looking for new and exciting ways to reorganize? Kitchens are one of the easiest rooms to reorganize. Your kitchen situation may often change depending on your buying habits and needs. Instead of sharing basic kitchen organization ideas, why not take it a step further with these creative kitchen ideas? If you are looking for fun ways to organize, you will want to stay tuned because we have five tips for you! 1. 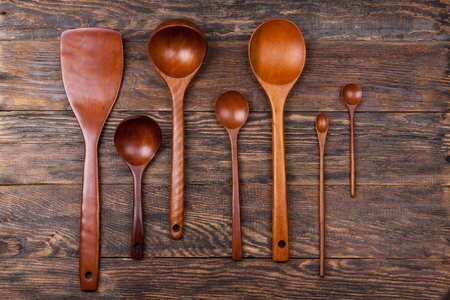 Paint Your Wooden Utensils. Have you ever been digging through your utensil drawer trying to find the right spoon? If you find yourself constantly searching, you may benefit from painting the bottom of your wooden spoons. The key is to paint each utensil a different color. This way when you are making dinner, you know to grab the “dark green” wooden bottom. 2. Switch Boxed Items to Jars. Not only will jars look more organized and sophisticated, but it can cut down on bulky items. Switch all your boxed items into glass jars for a clean, fun look. Just make sure to recycle the leftover boxes! 3. Hooks for Pans. A way to add uniqueness to your organization is to find antique hooks to hang your kitchen pots and pans. You can line the hooks on your kitchen walls and the pans can serve as decor pieces. 4. Display Your Dishes. What better way to force yourself to be organized than have all of your dishes on display? You can take the doors off of your cabinets and let the world see your dishes. For a creative twist, you can paint the inside of your cabinets fun colors. 5. Magnetize The Spices. If you are a lover of spices, you know how difficult it is to find the right spice while cooking. With so many options burdening your drawers, you may choose the wrong one while cooking. To make sure you are always reaching for the right spice, you can magnetize the bottoms. You will just need to buy a magnetic board to attach all of the spices to and write the spice names on the jars. We hope you enjoyed these easy, creative kitchen ideas. Visit our the rest of our blog page for more life ideas and flooring information! This entry was posted in Kitchen and Bath by creatingyourspace. Bookmark the permalink.